Jute and Sisal from Around the World! 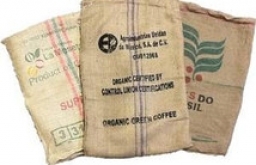 "Santos" and "Heavy" bags, also known as "gunny sacks," exhibit similar burlap material yet vary by weight and size (Heavy are thicker/heavier and longer). "Colombian" and "Mexican" bags, also known as "grass sacks," are of a coarser material than Santos and Heavy, and vary in tightness of weave (Mexicans having a tighter weave). Stop by to see the various ones in stock! Santos - 27"x40"; Colombian - 29"x37"; Heavy - 28"x44"; Mexican - 29"x38".